We stood watching Pittsburgh make a pass in the final seconds to win the Super Bowl as our flight to Auckland was boarding in Los Angeles on February 1st. We rushed to the gate during final boarding and three days later, on February 3rd, we arrived in New Zealand. First landed in Auckland where we changed planes and took off just as the sun was rising, then at our destination of Christchurch. 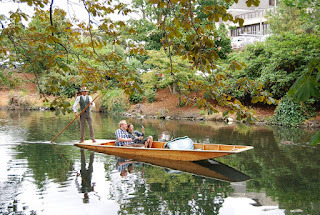 As we rode to our hotel adjacent to the Botanical Garden in New Zealand's "Garden City", our friendly shuttle bus driver Sandi mentioned that we could "go for a punt" on the Avon River. At first, thought she meant we could do some type of gambling, but soon realized that she was referring to the traditional punt boat with a young man sanding on the back and pushing with a pole. 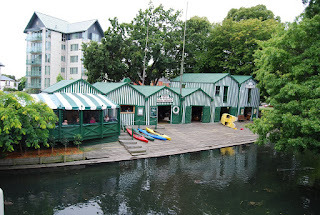 Visiting the old boat house, we decided to hire some kayaks (made by LL Bean in the USA). In the evening we roamed a restaurant area adjacent to the Avon, ending up at an Irish place called The Bog. A huge table in the back was full of musicians ready to have a good time on the weekly jam session. Day One impressions of New Zealand: Everything works, people are friendly and fair, well kept gardens everywhere. Only someone who's lived in China as long as you have would notice as a first impression that 'everything works'. Keep posting to the blog. We get to enjoy it vicariously! 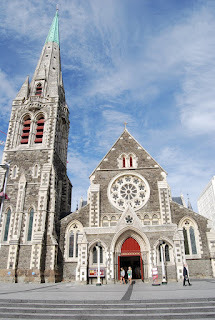 You have a wonderful time holiday in Christchurch New Zealand. When will you come in Sydney Australia?